If you know how to drive a motorcycle and understand what true freedom is, you will be excited about racing on professional tracks on a crossover bike. You will experience a steep descent from the island's center to the ocean through the jungle, a few kilometers on a deserted beach at insane speed, steep turns on slippery sections of the road, climbing the mountain on volcanic rock, dirt, water, sand, gravel, unforgettable emotions, adventure and delight of victory over all the obstacles. Beginner. Great way to dive into the world of motocross. Suitable for people who did not even try to ride a motorcycle with a manual transmission. Professional instructors will teach you all the necessary skills, which you can test on the training track. Advanced. A real adventure in search of the limits of your abilities, challenging tracks, stairs, vertical slopes, sharp turns, a lot of dirt and difficult terrains. Pro-fans. Multi-day trips by bikes along Bali and other islands, it is a whole different life for a couple of weeks. Only for those who are truly professional enduro and are ready to face any difficulties. There are tracks of different difficulty options for all levels of racers. The route can be difficult even for the most advanced riders, especially during the rainy season with slippery soils and mud. The track passes through tropical forests and rice terraces with natural obstacles (plants, logs, stones and rivers). At the appointed time of the meeting in your hotel/villa will arrive a driver of the company Bali Dirt Bike. You need to wait for the car at the reception of your hotel or near the villa. The driver will take you to the base camp safely, without hurry and on time. In the base camp the leader will give you the equipment, help to put it on correctly and conduct a detailed briefing, during which you will learn the peculiarities of the upcoming route. After preparations you choose a motorcycle. The instructor will check the tyre pressure and fuel in the tank. Along the route you will be accompanied by the group leader — rider who chooses the best route for the group and feels each racer; and also the swiper - rider who will help to lift the fallen motorcycle, not allow to come off and will give good advice when needed. When all the preparations are finished, the group leaves the base camp in the direction of the Taban jungle. During the route there will be a few stops for rest, corrections of possible mistakes and personal recommendations, which you will receive from the professionals. The first break is made in the jungle at the waterfall, where you can swim in refreshing waters and relax. The main part of the route takes place in the jungles of Tabanan. The track runs through the Jatiluwih rice terrace, which is a UNESCO world heritage site. Thanks to friendship with local villages and communities, you can freely drive around Tabanan and explore the area. After returning to the camp you relax, drink coffee, share emotions. As a gift you will receive a branded t-shirt Bali Dirt Bike and a video of riding along the route. After rest, Bali Dirt Bike transfer will take you back to your accommodation. The exact time of arrival depends on traffic and the location of your hotel. My Son and I booked for a learn to ride session and had such a great time. The track really uses the natural terrain and has all the challenges of a bigger race track. Coach really helped us with tips to improve. Everything was provided, boots, pads and even shirts and race pants and they made sure we were on the right bikes for our experience level. The bikes are awesome, the guys are wicked and this is one of the best ways to see Bali: riding alongside rice fields, through the jungle and across the rivers. The guys look out for you all the way, and then at the end you get to sit down covered in mud and enjoy some amazing local food. If you want an adventure, this is the trip to do!! Wow, what an amazing experience. Book the day before and the guys were very accommodating. Got picked up from my hotel on time and headed out to their base Booked an adventure ride and was not disappointed, amazing scenery and really good food for lunch Will book again when in back!! First of all, most important for me was equipment - I'm afraid of riding in street shoes. Luckily, here you'll get all equipment you need - motocross boots, knee and elbow protection, back protection, good helmet and gloves. Also, I was afraid of riding old used bikes. 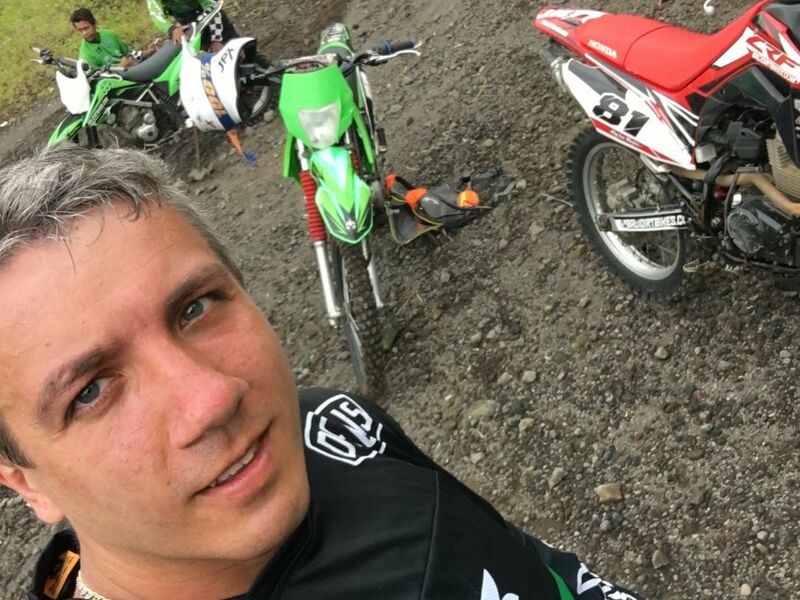 Here you could find almost new Kawasaki KLX in veery good condition. 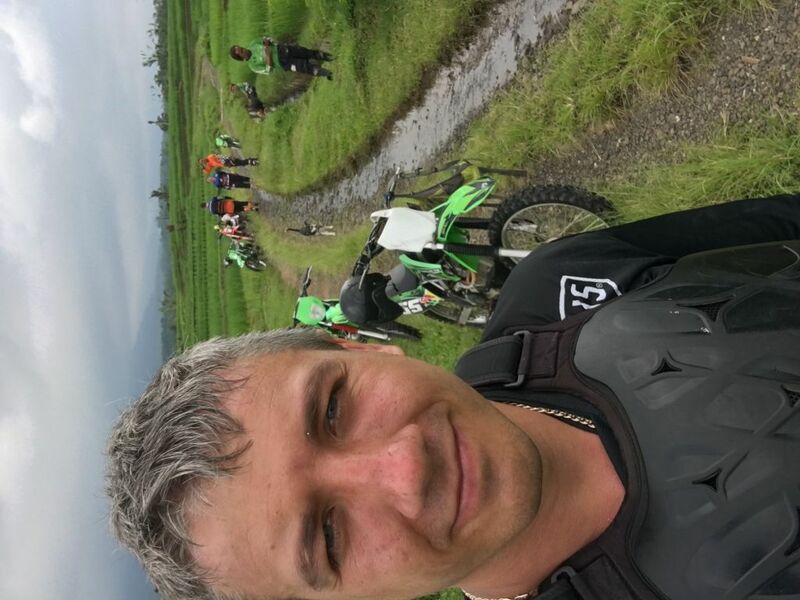 About tracks, if you have experience - I mean real experience, not just 2 weeks on scooter here - you should go to adventure track. It's absolutely crazy. If not - there is very nice intermediate track. It's not very difficult but very scenic - rice fields, mountains and local villages. And finally - you could take shower there! Really, that was most refreshing shower in my life. Because I went to adventure track and in was really HARD enduro. What can I say, besides I absolutely love it. Ive been over three times. Going again this weekend cant get enough. Great mix of tracks, intermediate was awesome for learning the ropes before trying out the Adventure track which i highly recommend. Awesome mix of tight muddy trails to flip worthy hill climbs. They provide all the gear needed and also provide plenty of drinks to keep you hydrated when your sweating it out on the tracks. The guides are your saviours, always there to help you out when you get stuck (you will get stuck if you choose adventure). Great mix of scenery and photo ops throughout ,the guides also film you with go pros mounted on their helmet. The owner Putu is a legend, a die hard motorx fan who has welcomed me every time, he runs a tight ship making sure all the bikes a running well and everyone has all the gear needed. I had 1 day of pure awsmness, excitements and adventure with my friends. The organization works just fine, uncomplicated pickup arrangement and brand new equipment made the trip special from the start. We could choose out of a various range of brand new KLX 150cc, KTM 250 bikes which made it fun for everyone. Инструктор четкий! Интересно было покататься по красивейшим местам))) Всем советую, незабываемый кайф! Техника и экипировка в отличном состоянии, прекрасные сопровождающие (один из нас упал на камень и сломал рычаг тормоза, сопрождающий снял рычаг со своего байка и поставил вместо сломанного), интересный маршрут. Действительно откатали 4 часа, все было на уровне, дали все снаряжение, всю защиту и экипировку. Было 2 проводника, которые всегда помогали в трудных ситуациях. В общем круто! Рекомендую!! Позитивные люди, живописные места (даже катаясь по местным дорогам). Программа в целом хорошо заряжает энергией. Как доп плюс - возможность арендовать gopro. Организация на хорошем уровне. Подобрали в отеле и туда же привезли по окончании, был включен ланч, с собой давали 2 бутылки воды, также был предусмотрен бокс для вещей с ключем. Оплата на месте наличными или картой. Байки хорошие, выдают всю экипировку, за мной как за начинающим закрепили отдельного инструктора, который обучал и вытаскивал байк из ям по необходимости) единственное,что подпортило впечатление - я наверно переоценил свои силы,и получил травму колена уронив на ногу байк. Будьте осторожны. Поездка на ендуро покатушку очень понравилась и запомнится надолго. Понравилось: забрали из отеля точно в указанное время, снабдили экипом, двумя гидами, которые всю дорогу помогали покорять джунгли Бали, водой и едой, душ по окончанию поездки, можно использовать свою экшн-камеру. Подарили джерси! Состояние байков норм, но аккумы дохловаты - к середине поездки на моём байке перестал крутить стартер и пришлось работать киком. Трасса через джунги с выездом через рисовые поля - мегакруто! Брал покатуху на пол дня, рекомендую! Аня! Аня! Спасибо ! Ребятам огромное и тебе! За этот невообразимый кайф! Джунгли и практика - это нечто! Если честно то организация супер! Ребята супер! Ну в общем то от близких по духу я ожидала , но они превзошли все мои ожидания!И фото и видио и отношения и в подарок майка! Я в них просто влюбилась! Жаль сказать не могу. Знала б лучше взяла бы ещё с ними 8 часов , чем нырять с мантами денег взяли ,а фото не о чем видио нет и за трансфер содрали 50$ - жестоко.Если вернусь сюда , то все трекинги пройду с ними ! Правда! Это нечто! Виды , джунгли , грязь , подъемы , скорость.Адриналинище!! !Если ты не был на мотокросс е , ты не видел Бали!!!!! Спасибо! Здорово если бы ещё был 2-3х дневный трекинг по острову! Ребята ! Удачи Вам!!!!! Сам мотокросс мне понравился. Я пробовал это впервые, так что впечатления и эмоции остануться на долго. Сервис на высоком уровне. Но сама поездка на кроссовых мотоциклах по джунглям на мой взгляд очень опасна! Есть много мест где можно легко навредить себе и мотоциклу. Например езда по колее в которой есть коряги, и эта колея проходит прям рядом с обрывом. Некоторые места были сильно размыты. Это явно не для новичков. Плохо обучили т.к. англ слабоват у них. Оказалось что я тормозил неправильно, нельзя выжимать сцепление. В общем для новичков нужна другая трасса, более ровная и не такая опасная.